When I was completing work on The Gloucester Fishermen's Wives Memorial in 2001, Susan Foley came to me in search of a sculpture that would work with her first concepts for the Dora Efthim Healing garden. She and Cynthia Mayher, the Executive Director of Parmenter VNA & Community Care, for whom the garden was to be built, were firm in their resolve that the sculpture not be representational. So, this was a parameter right from the start. Instead of feeling constrained by this request, I found it to be liberating. Inspired by the Native American concepts Sue was using to structure the garden, the basic idea for Rain Catcher came to me the very evening of her visit. It had been stimulating experience finding a natural bolder for the base of the Gloucester (GFWA) memorial. I think of its 20 ton glacial erratic as an integral part of what the memorial has to say. When Susan presented me with the challenge of saying something about healing and wholeness, in the midst of nature, without using the human figure literally, my thoughts turned naturally to the beautiful stones I had been studying for the past two years at the quarry in Rockport. Among the stones that held my interest were the cut and split remnants of the quarrymen's work. Another search was on, and eventually, the three stones of Rain Catcher made themselves known to me. I was able to do some preliminary set up work at the quarry. The stances of the individual stones and their gestures relative to each other seemed crucial to me and the slightest changes in the angles would make the stones look all wrong. I began to think of the stones as figurative. In this way I called them the Ancestors, hoping that the name would be evocative rather than defining. 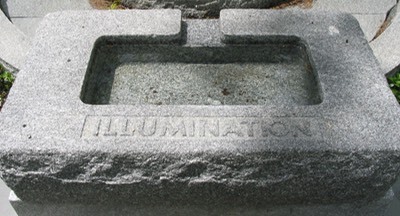 Similarly, the words Illumination, Wisdom, Introspection, and Innocence carved in low raised letters on the granite edges of the pool are meant to be secondary discoveries to the garden experience rather than defining road signs to a single or limited interpretation.